For all those top quality items that you wish to elevate just a little above the rest, Wood Pedestals are a wonderful choice. 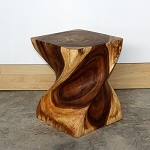 From modern to natural/rustic in appearance there are pedestals to fit your desires. 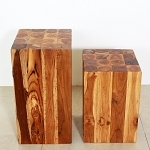 Teak block stands are hand carved and show off the gorgeous wooden grain in both the oak or chestnut finishes. 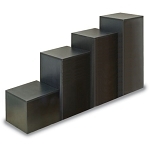 Laminate Wood Display Cube - 12"
Hand Carved Double Twist Stand - 12in. x 23in. Hand Carved Double Twist Stand - 12in. x 26in. Laminate Wood Display Cube - 24"
Laminate Wood Display Cube - 30"
Laminate Wood Display Cube - 36"
If you are one who loves natural wooden stands there are beautiful twisted varieties in several oil finish choices. 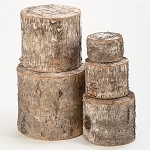 Hexagon Bamboo Set Round Wooden Pedestal Square Wood Set Merchandising Platforms For the more modern edge to your location there is a wide range of laminated wood pedestal stands. Black or white options in many different sizes as well as finishes that beautifully resemble granite and other stones. Take a peek at the laminate turntable pedestal for a retail stand that allows your merchandise to turn while on display. Glass pieces with the right lighting are eye catching on a turntable display. When you want retail display stands that are sure to showcase and set apart your best pieces these wooden stands are the way to go!